CIA Director John Brennan voted for the Communist Party candidate in the 1976 presidential election. Brennan told a congressional panel last week that he "froze" while taking a CIA polygraph test four years later when the questioner asked him if he had ever worked with or for a group that was "dedicated to overthrowing the U.S.," CNN reported. 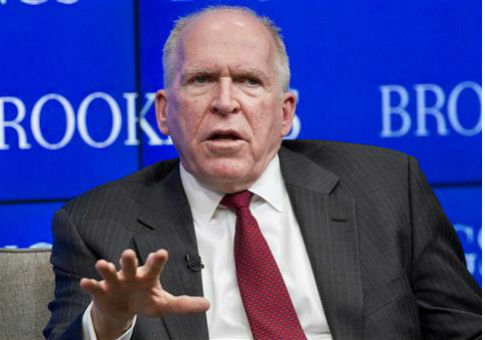 "This was back in 1980, and I thought back to a previous election where I voted, and I voted for the Communist Party candidate," Brennan said at a panel discussion regarding diversity in the intelligence community during the Congressional Black Caucus Foundation’s annual conference. Someone had asked whether experience in political activism could harm someone who later attempts to obtain a security clearance. Brennan said the CIA is committed to upholding the values of the Constitution. "We’ve all had indiscretions in our past," he said. "I would not be up here if that was disqualifying." Brennan said he decided to acknowledge his vote for Communist Gus Hall, the Communist Party USA’s four-time presidential candidate, when undergoing the lie detector test. "I said I was neither Democratic or Republican, but it was my way, as I was going to college, of signaling my unhappiness with the system, and the need for change. I said I’m not a member of the Communist Party, so the polygrapher looked at me and said, ‘OK,’" Brennan said. "So if back in 1980, John Brennan was allowed to say, ‘I voted for the Communist Party with Gus Hall’ … and still got through, rest assured that your rights and your expressions and your freedom of speech as Americans is something that’s not going to be disqualifying of you as you pursue a career in government," he continued. This entry was posted in Politics and tagged CIA, Communist Party, John Brennan. Bookmark the permalink.